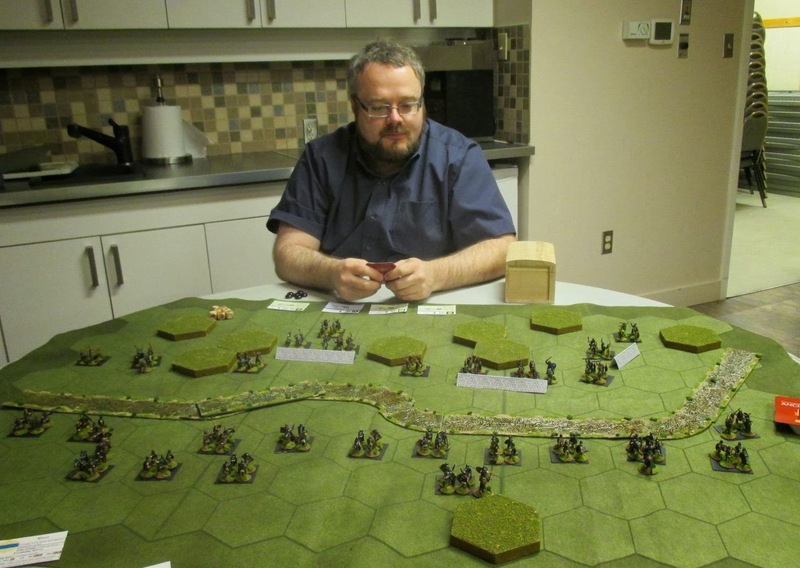 Last night Bruce hauled out the World at War WW3 scenario he ran at the club last week. He adjusted the mechanics by reducing the American activations by half and we were off. 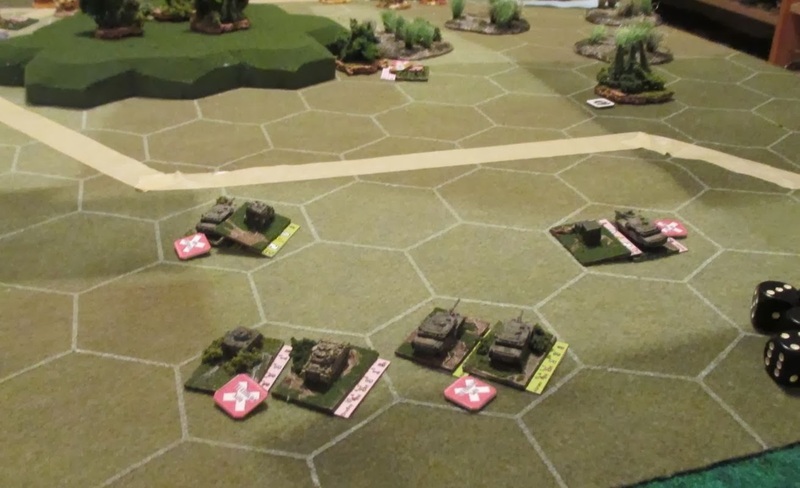 My very small number of US tanks was tasked with seizing a village from a horde of over-extended Soviets. 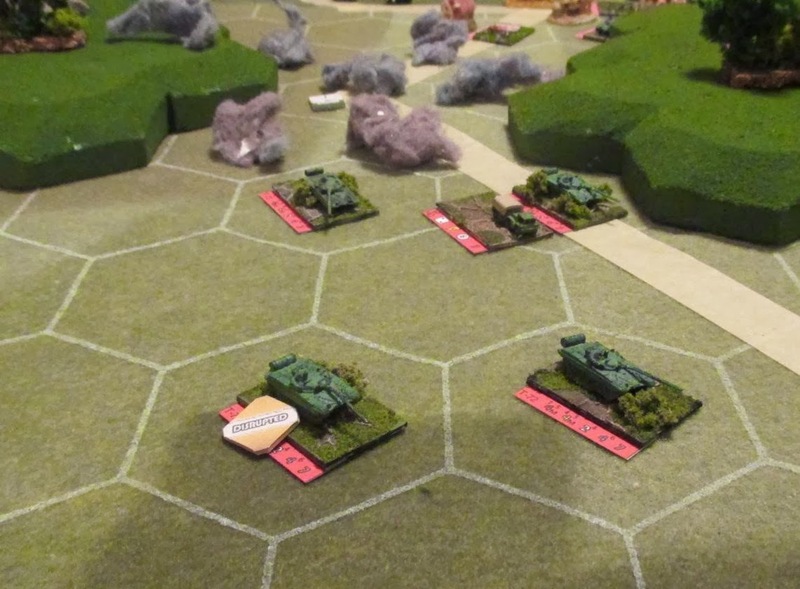 The Soviet tanks moved to intercept me but smoke choked off their fire lanes. In the meantime, I leap-frogged across their front (wow, an actual tactic!) to get over to the right and drive on the village. 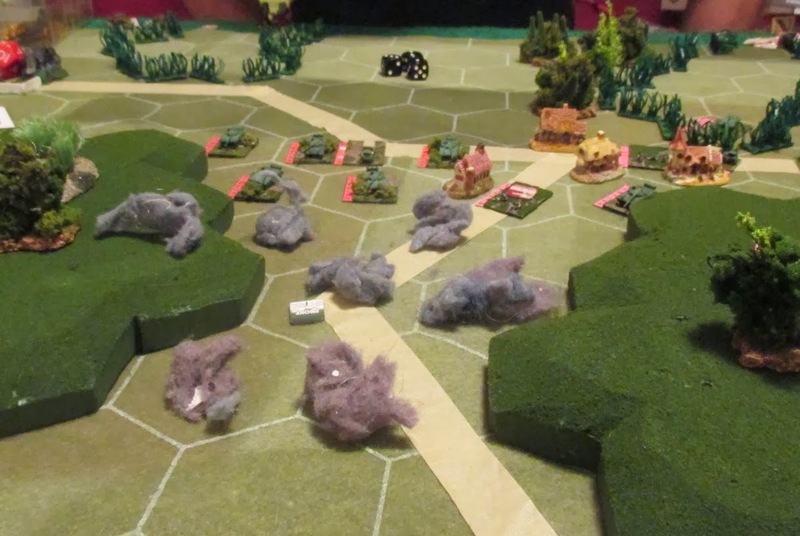 The Soviets eventually burst through the smoke, hoping to catch my flank exposed and me engaged with the town's defenders (what a jerk!). But the Abrahms beat the hell out of the T-72s and the Soviet command ordered an advance towards the rear. Then a bunch of T-55s got munched. 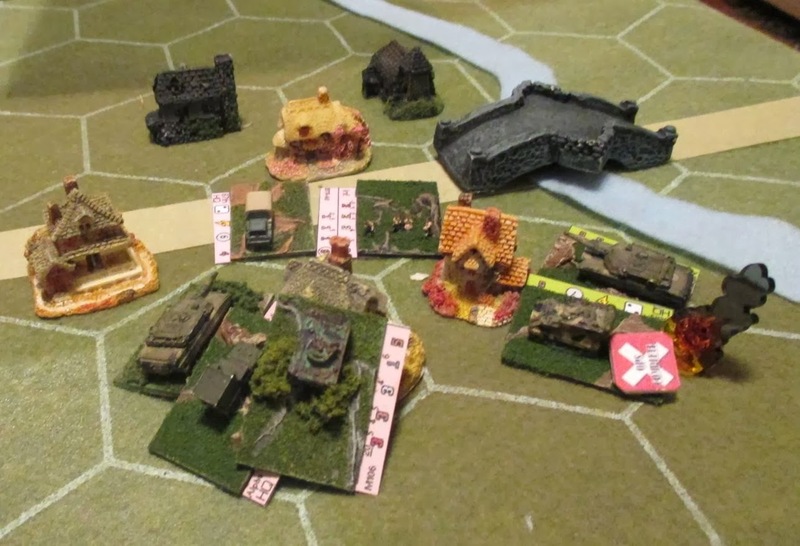 After several more turns of nasty firefights with the Soviet infantry, it came down to the last card of the last turn and the stinking Soviets held on for the win. Arrrrrgh!!!! But it was close. All I have to say about this system is wow. It completely redeems modern combat for me. Simply and pleasantly abstract (in a DBA-style) but still recreates a lot of tough decisions. Do I move or fire? Oh wait, I'm a late '80s US tanker. I'll do both. BBQ perogies anyone? Up next: I have a bunch of 1/72 ancients half done. My sore back and a slight flood have stalled me out but I am hopeful I'll be ready to go for Tuesday at the club. This is the Family Day weekend, here in Alberta. Family Day means Monday is a statutory holiday. The origins of the weekend are that then-Premier Don Getty needed to distract people from his son getting busted for traffic blow so he created a new holiday. In February. 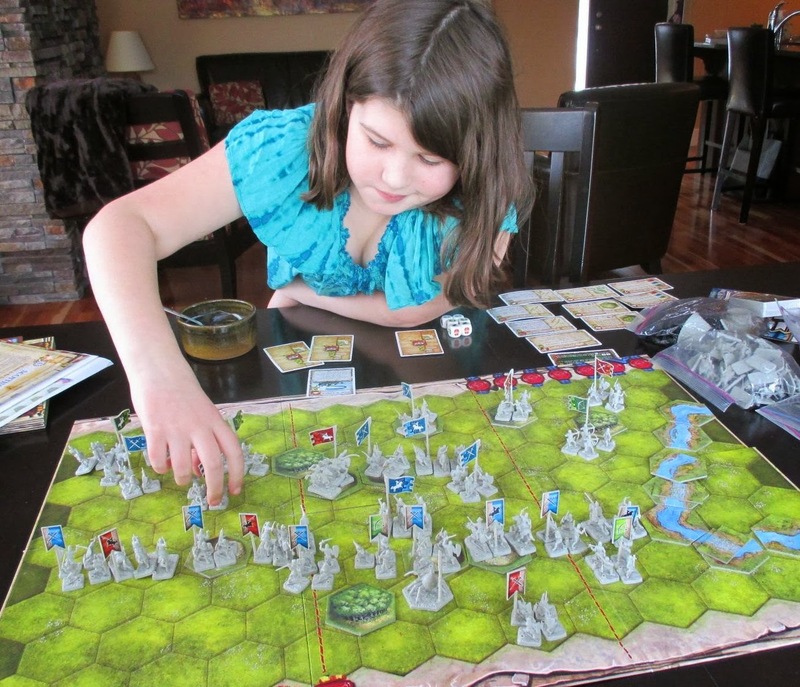 Fast forward 25 years and Jessica wanted to celebrate with some Battlelore. 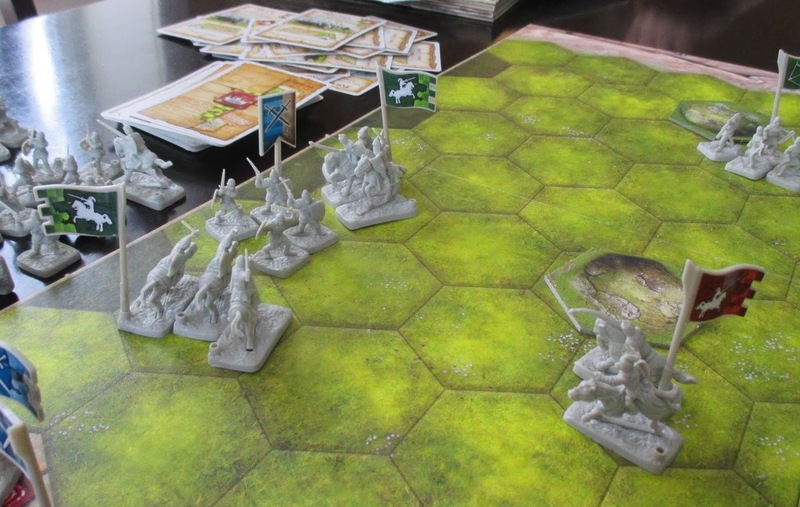 It has been so long since I have played Battlelore than I had to quickly relearn the rules (mostly the rules that differ from CCA or CCN) and we played a mostly medieval game (plus a giant spider). 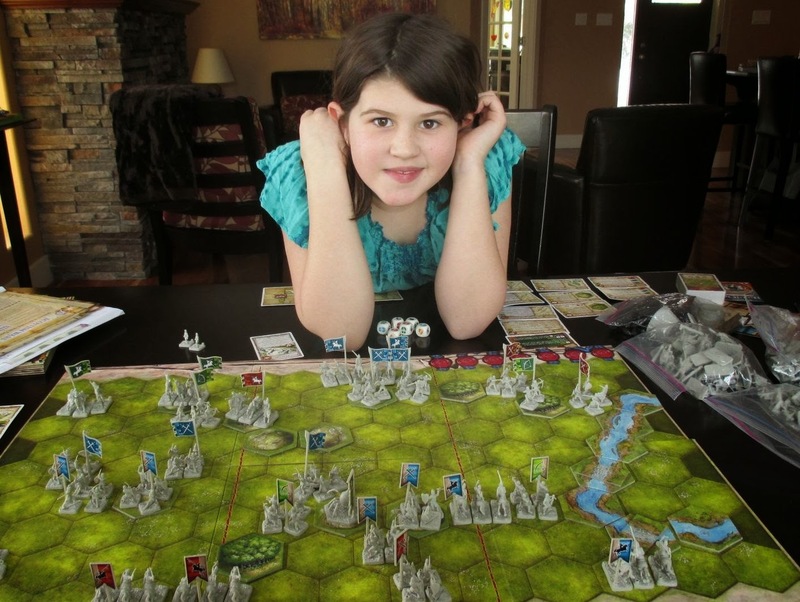 Jessica squeaked out a victory in game in (6-5) throughs one aggressive cavalry charges. Below you can see her cornering my medium foot. She explained (very patiently) that by moving her light cavalry behind my foot they couldn't retreat. I confirmed I was familiar with this tactic. Game two was more exciting (for me). I was dealt both mounted charge cards so I spent about 7 moves setting things up. Jessica moved forward to fight and I creamed, rolling up unit after unit. She was a good sport given the game was 6-0 and over rather suddenly. Wish I could play that well at the club! Up next: Hard to know. My back is all grabby so painting for long periods is difficult. 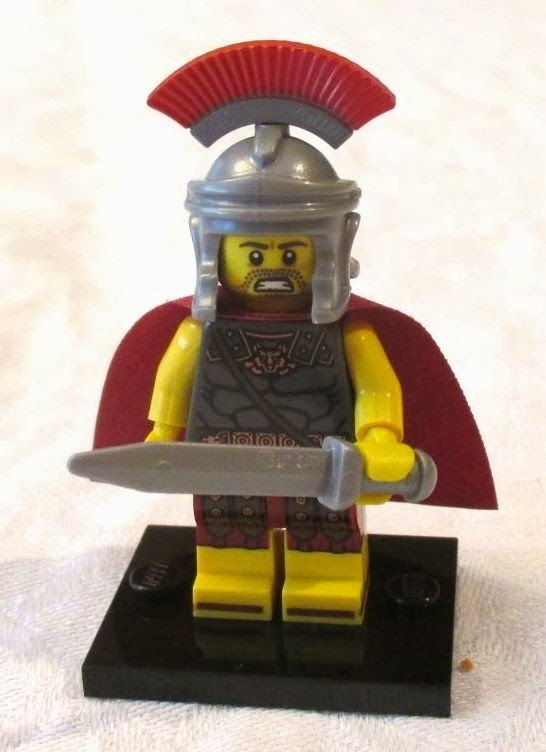 I will try to knock off some more ancients. 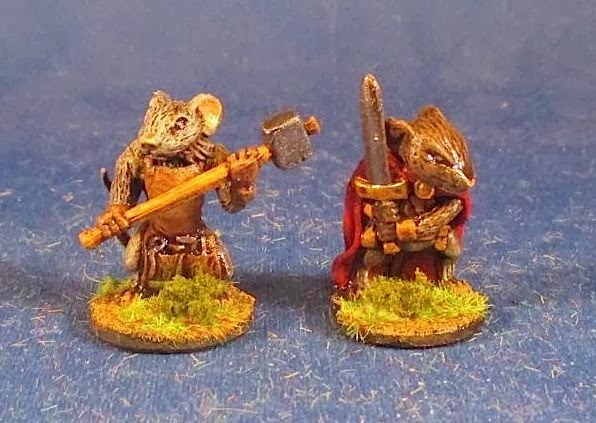 I really should paint these Battlelore figures one day. Hmmm. After a bit of a sore back, I've returned to painting and have knocked off six Celtic chariots to give the Brits some more variety in their units for CCA. These are HaT chariots. I find chariots always a bit fiddly. I love the chariot drivers who are kung-fu fighting. And I'm glad these guys are done. 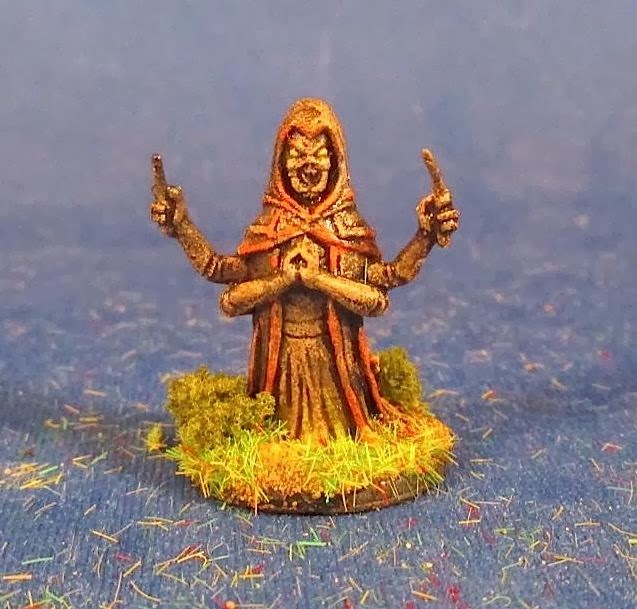 I've also used the figures to do a tutorial on painting 1/72 figures for newbies. Up next: I can't make the next club night but I hope to push some more figures out the door (1/72-scale cavalry) and perhaps do a tutorial on basing. I popped out to Bruce's last night for a game of World at War. 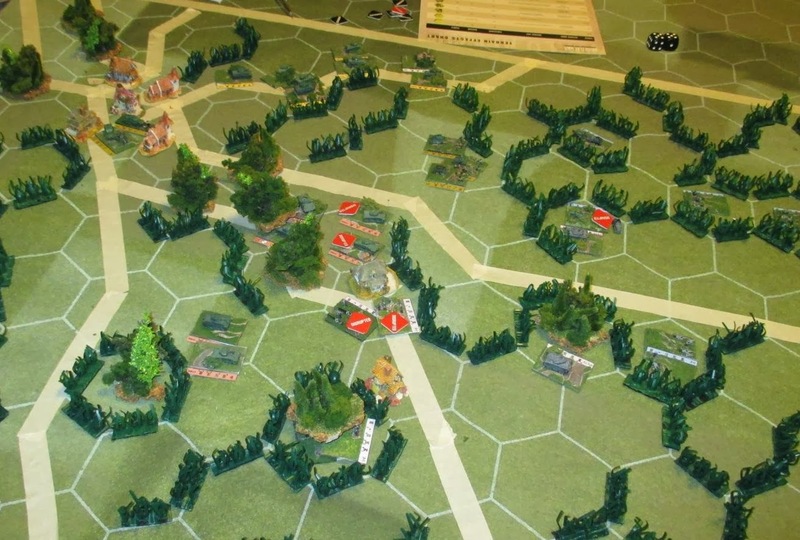 We used these WWW3 rules with some WW2 stats Bruce found on BGG to replay a bocage scenario that we played two weeks ago with Panzer Grenadier. Wow, what a slick game. No charts, simple mechanics and the game played in half the time with no real loss of quality that I could see. The card-based activation is very smooth and the combat mechanics are uniform across different match-ups. Decent command limits and some nice little adds on such as how infantry and tanks interact depending on the circumstances. Up next: I have some 1/72 Celtic chariots that are almost finished--just need static grass. Then obj to some more 1/72 barbarians. We had eight guys (including one Guy) out at the club last night and three games ran. 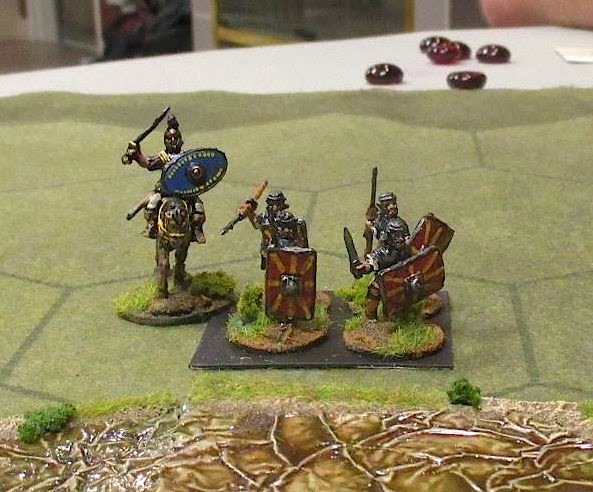 Dave hosted a game of Hail Caesar, trotting out some Dacians to take on his late Romans. 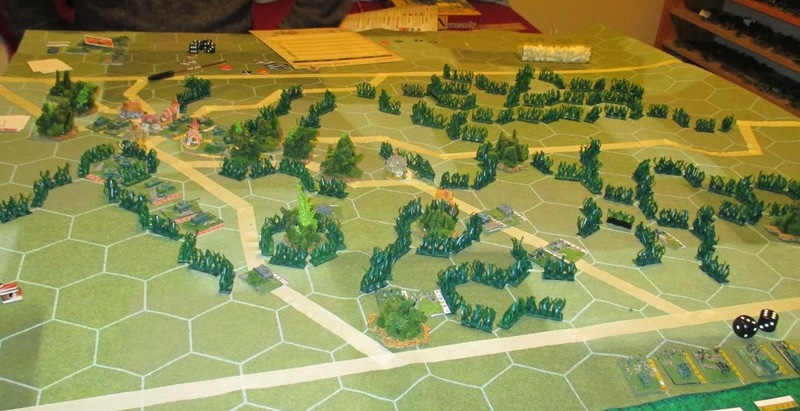 Bruce had some 15mm Maurice out, with the Battle of Saratoga resulting in a huge American win (and Terry didn't even have to manipulate the terrain to win!). Scott and I played three games of CCA. This was a Romans versus Celts game set in 51BC and Scott beat the holy hell out of me in all three games. I wish I could say I threw the games to make him feel better given that a Girl Guide mom creased his car for, but I'm not charitable like that. The first two games were reasonable close (6-4). The third game was a stomping (6-1?) that started out with an arrow through the eye of my general and went rapidly downhill. A couple of line advance cards helped him out as did some bad rolling on my part, but what a beating it was. We discovered I needed to make the bases I'm using slightly thicker so we could grab them a bit better. Maybe card stock is the solution here. Up next: Some more 1/72-scale chariots for the Celts are under way. 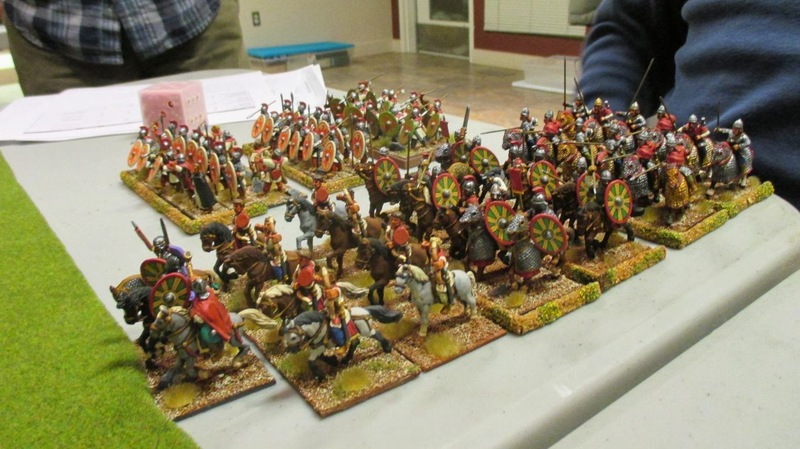 Then perhaps some more cavalry. 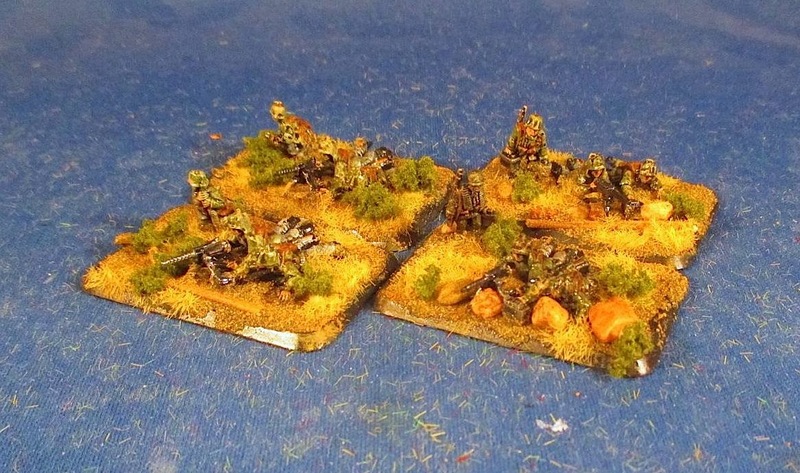 With few plans this weekend, I finished off some 15mm WW2 Germans to supplement an army I painted over the holidays. The first base are some tank killers. 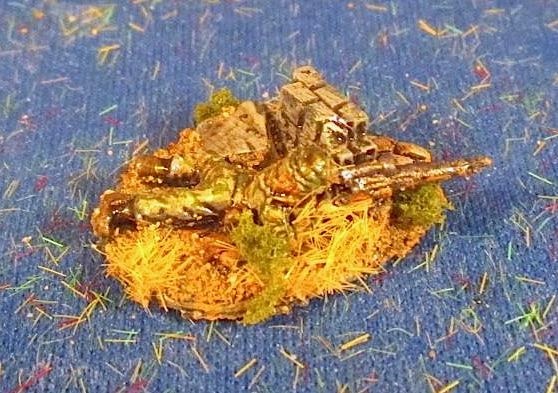 These are plastic 15mm Battlefront models. There is also a German sniper base (metal). This is a nice little vignette that is much better than just some dude lying prone with a scoped rifle. 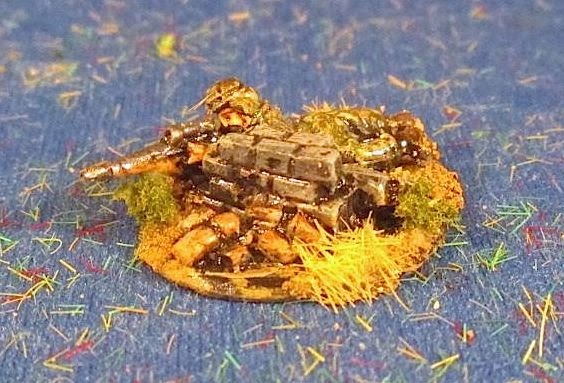 I also painted four bases of MGs to give some supporting. These are plastic Battlefront models. 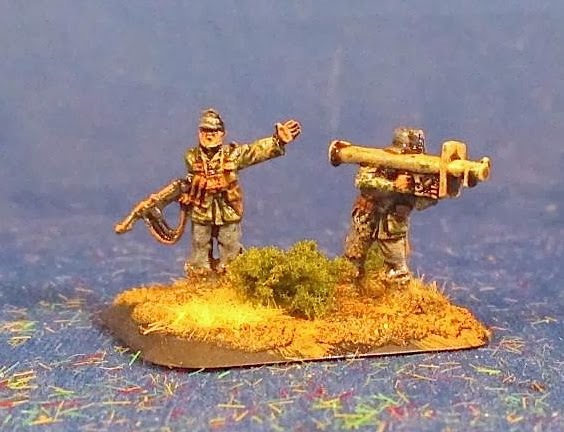 I was asked to do a paint-job conversion as the gunners are US troops (standing guys are Germans). Up next: Club night is Tuesday and I'm going to be working on some 1/72-scale Celtic chariots in the meantime. These are a mix of HaT and Airfix. 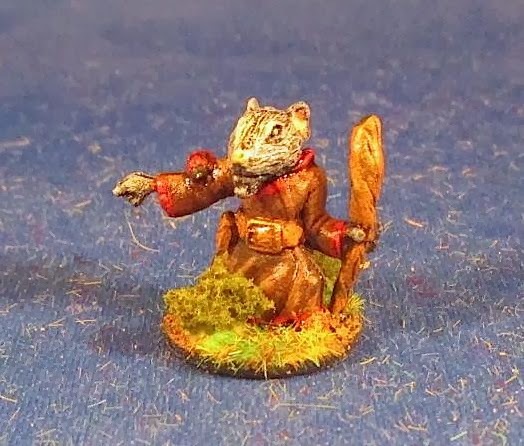 These are the last of a small commission I did on some board gaming pieces. There are roughly 25mm in size. 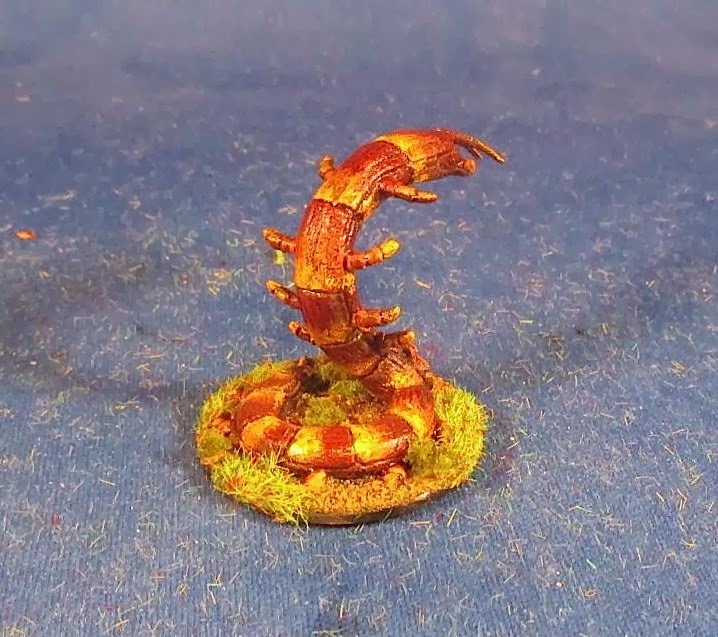 The centipede was a lovely sculpt and I tried to replicate the example I was given. It is slightly darker in person than the image suggests. 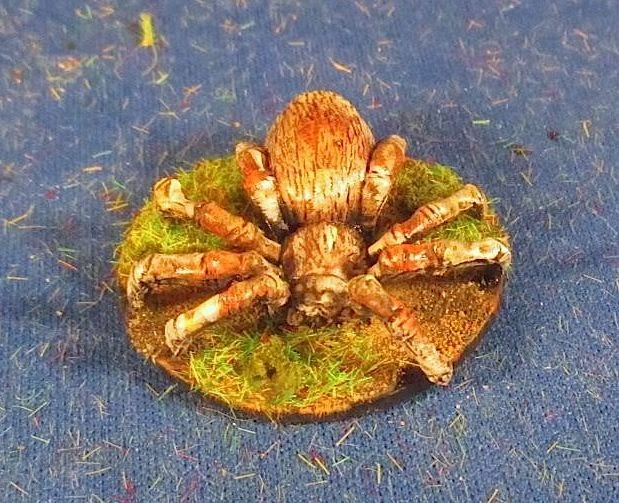 There is also a spider. And some sort of praying mantis dude. 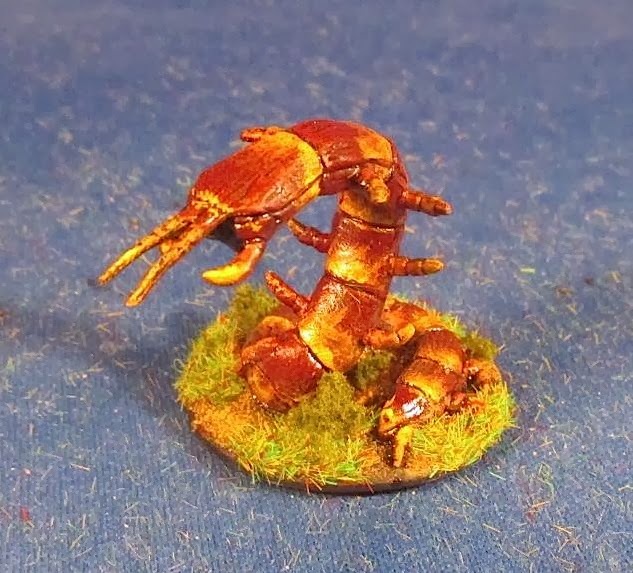 And finally some cockroaches (I think). Up next: The club on Tuesday and hopefully some 15mm WW2 guys by the end of the week. 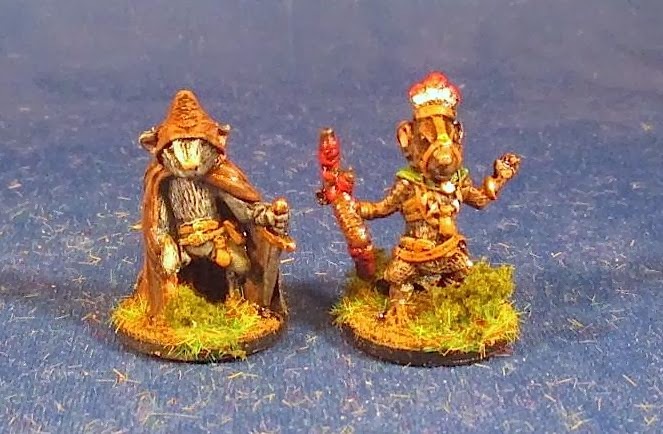 These are 25mm(isn) mice who appear to be the forces of good in a board game piece commission I picked up. Apologies for the nasty picture above--I had a hard time getting a decently balanced shot given the white dress. 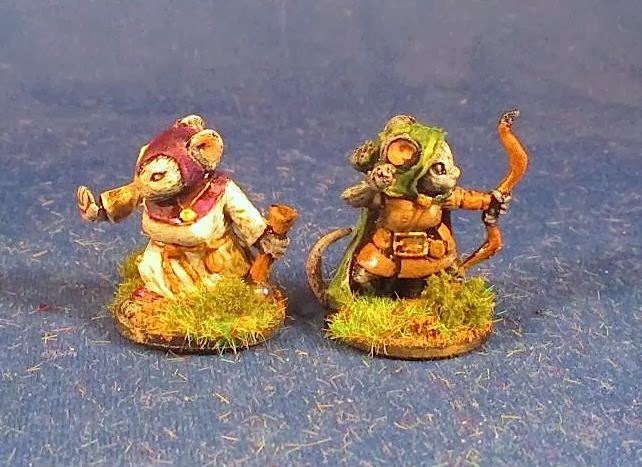 The huntress on the right is a sweet little figure with a separate arm to create lots of depth. These figures are slightly smaller than yesterday's rats. The detail is also not quite as deep, but I think they turned out okay. The fellow below has a lady bug on his arm. Lots of nice little touches like this on the figures (he also has a scroll held by his tail behind his back. 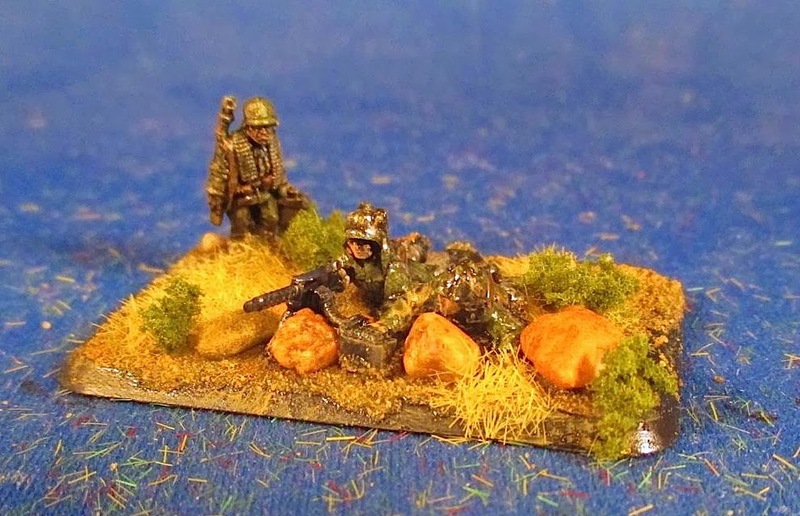 Up next: The last of this commission (some nasties) then perhaps a few 15mm WW2 foot units and club night.